Bi-fuel system is vehicles with multi-fuel engines capable of running on two fuels. On internal combustion engines one fuel is gasoline and the other is natural gas (CNG). The two fuels are stored in separate tanks and the engine runs on one fuel at a time. Bi-fuel system vehicles have the capability to switch back and forth from gasoline to the CNG. 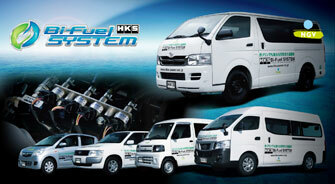 HKS provides conversion kit to make a normal gasoline vehicle into CNG Bi-Fuel system vehicle. It will become a highly fuel efficient vehicle.